First off I just want to share about how I got my computer back up and running again! This is how everything came about; first the hard drive started making noise. Normally I don't hear it at all and I knew that it wasn't really a good sign and sure enough it wasn't long before my eyes were graced with that beautiful dreaded blue screen. I knew that the hard drive still worked a little so I rebooted and backed up everything I had on the computer which wasn't much because I keep everything on the external and back up to the computer. I then went straight out and bought a new hard drive and went to IT here on the ship to inquire about them being able to help me out. They said that I had to come on Tuesday in order to get personal service and it was Wednesday when I asked which meant I had to wait an entire week. I could have tried to fix it myself but I thought it might be good to not have a computer for a week and spend more time reading, running, and spending time with friends. Tuesday finally came and I brought in my computer. They wanted to try to clone my hard disk and therefore avoid having to re install Windows 7 because I don't have the install disk here. Not to mention all of the programs that I have installed. They tried to clone the disk. They then tried again but it seemed that it just wasn't going to happen. At the end of the day I was left with a new hard drive that they had attempted to clone the old image onto that had failed. I had to look for a copy of Windows 7 to install. I found one from a friend on the ship and headed to my cabin to attempt to begin the slow process of getting everything back to what it was before. I put in the new hard drive and turned on the computer to install Windows and, to my amazement, the Windows 7 welcome screen came up! Somehow the clone had worked! The IT team said it had failed and here I am writing this post on a computer that (Besides the new hard drive.) is completely the same as it was before my hard drive died! I don't know how it happened but it really was an answer to prayer. 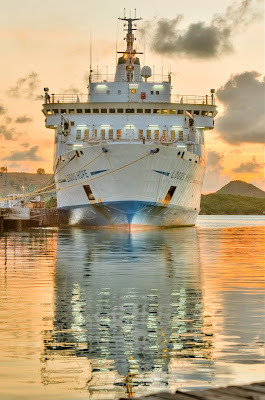 Above is an HDR of the ship that I took our first night in St. John's, Antigua. This port has been beautiful so far and I have been enjoying the people and scenery. Expect more posts soon! VERY COOL!! :) God is so amazing!! Thanks for sharing this incredible experience with us!! Praying that your computer and hard drives keep working for you! I can't wait to hear more! GOD BLESS and I'm praying for you!! So glad that the computer is working for you, Ben! What a story! God is good and I love how He takes care of the little things like that.